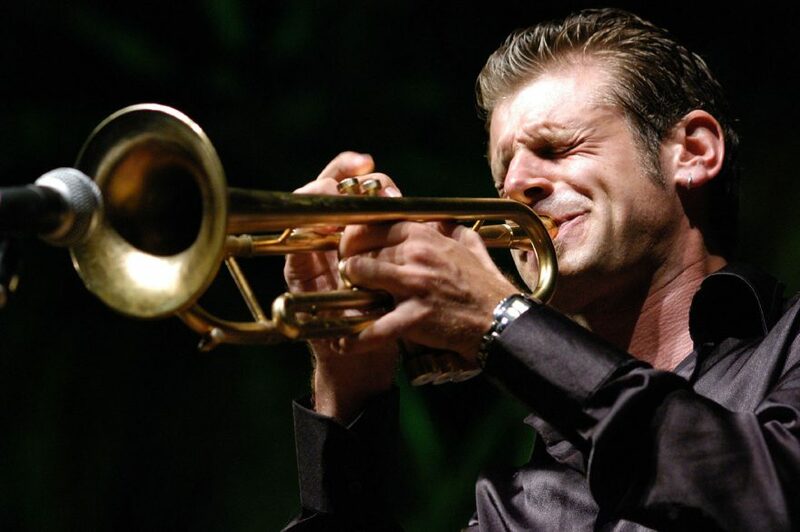 Graduated at the early age of 15 at the Conservatory of Turin, Italy, Fabrizio Bosso is one of the most talented trumpeters of his generation. His career is studded with precious gems: his original records have been recorded for Blue Note, EMI and Verve/Universal. Fabrizio’s style resounds with echoes from the classic bop era, among his notes and virtuosisms you can hear reminiscences from Clifford Brown and Miles Davis to Don Cherry, from Nino Rota to the great Chet Baker. It is Bop of third millennium, with amazing attacks, a proverbial sense of swing and a pouring speech; in fact, his desire to amaze has indeed given way to a balanced mix of virtuosity and poetry. The love for the Bop is always present but filtered by a great sensitivity and personal taste making his sound very contemporary, but still classic. The repertoire consists almost entirely of original songs by trumpeter, with a few forays in the standards, both jazz and not, and original repertoire of the other components, depending on the inspiration of the moment. His long list of collaborations with the cream of jazz, includes artists such as James Taylor, Joe Lovano, Dee Dee Bridgewater, Mario Biondi, Stefano Di Battista, Rita Marcotulli, Ian Shaw, Raphael Gualazzi and Lucian Biondini, just to name a few. Fabrizio brought is various projects on all the most legendary stages, from the North Sea Jazz Festival to the Ronnie Scott’s, from Le Parc Floral in Paris to Monte Carlo and as far as Argentina and Japan, where he is a real star with many sold-out shows in Tokyo at Blue Note and at the Jazz Festival and at the Billboard in Osaka. A new exciting chapter has just been added to his brilliant career: TANDEM is Fabrizio Bosso’s new album, his third release on the prestigious Verve label. After PURPLE, last year’s Gospel-oriented album with his Spiritual Trio, now it’s the time for a thrilling duo album, where the telepathic interplay with Anglo-Italian pianist Julian Oliver Mazzariello is no less than perfect. Both artists master their instruments so well, and with such an evident knowledge of the history of jazz, that the listener barely realizes that this is a duo: the way Bosso shapes his sound, the way Mazzariello not only is at ease with piano soloing (a real challenge for any jazz pianists), but also provides a sensitive and swinging accompaniment, is a fantastic experience.